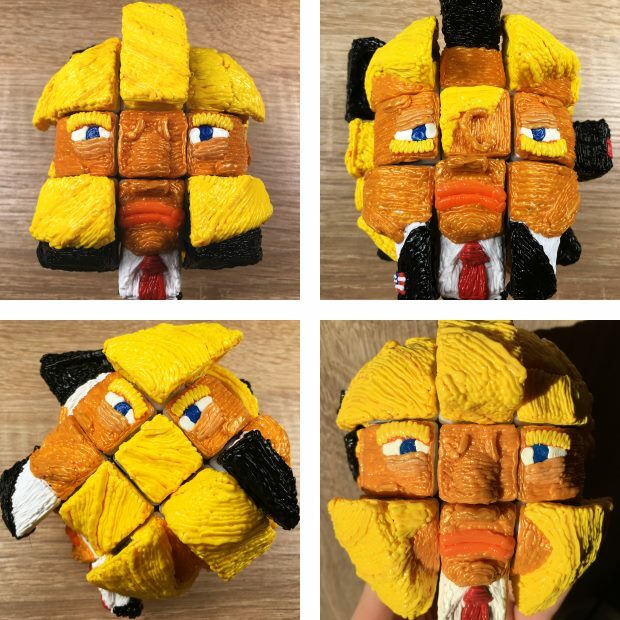 "Watch the face of the US president Donald Trump being 3D printed on a Rubik's Cube with a 3D pen. Timelapse video in 5 minutes. I didn't want to flout the president with this project. I chose to 3D print him because of his recognizable figure and because I have much yellow PLA left from my SpongeBob cube. The video starts with trimming off the edges and corners of a cheap $2 Chinese Rubik's Cube to bring it to a sphere shape. Next I created base with grey PLA filament. I added the contour and the base of the yellow hair slightly farther from the center of the cube. I didn't have too much orange plastic I built the face with white and coated it with a thin layer of orange. The black suit came next with a tilted base.